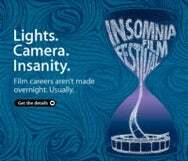 Apple’s been running the Insomnia Film Festival competition for the last few years, encouraging students to create 3-minute films in just 24 hours for a chance to win fabulous prizes. Unfortunately, it appears that the most recent event won’t be happening. Don’t expect to find news about it on the web, though—as Infinite Loop reports, Apple’s simply disappeared the page, lock, stock, and barrel. TUAW reported back in November that the competition had been postponed due to issues with servers, and apparently they weren’t able to reschedule. The company reportedly sent an email to those who had already registered with a message to that very effect, with the added assurance that there would be other opportunities to demonstrate their creative efforts. Oh well, sad as it is that students won’t have a chance to walk away with Apple hardware or software, look at the brightside: nobody really wants insomnia, right?